To make it easy to understand, let's break it down in simple terms: "Beamforming" refers to focusing a Wi-Fi signal in a particular direction, as opposed to spreadings it out in every direction. 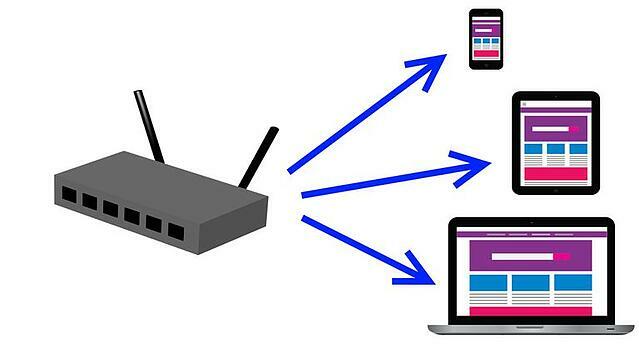 Routers with beamforming technology can locate your devices (computers, smartphones, etc.) and beam Wi-Fi signals directly towards it. ZyXEL's ARMOR Z1 is equipped with Beamforming technology to focus and amplify its signal directly to your wireless connected device(s), allowing you to connect wirelessly online throughout your whole home. "Beamforming is made possible by transmitters and receivers that use MIMO (multiple-input, multiple-output) technology: Data is sent and received using multiple antennas to increase throughput and range. MIMO was first introduced with the 802.11n standard, and it remains an important feature of the 802.11ac standard." Beamforming entails an advanced algorithm that keeps track of several parameters, such as terminal location, speed, distance, the level of QoS required, signal/noise level and traffic type. This gives beamforming a greater advantage when it comes to signal improvement. Beamforming functions by shaping the beam in the direction of the receiver. A number of antennas broadcast exactly the same signal; however, each one is specifically distorted in the phase. An algorithm applies a signature to every transmission. The various transmitted shapes merge in the air by normal coherence of the electromagnetic waves, thereby forming a virtual "beam", which is a signal that is targeted toward the destination. If the beam travels to undesired locations (locations other than the destined receiver), the phases will collide and be destroyed. In theory, the increase in the number of antennas used in the array results in a much stronger beamforming effect; every additional broadcast antenna could possibly double the signal. Higher SNR: The highly directional transmission enhances the link budget, improving the range for both open-space as well as indoor penetration. Interference prevention and rejection: Beamforming prevails over internal and external co-channel interference (CCI) by taking advantage of the antennas' spatial properties. Higher network efficiency: By substantially minimizing CCI, beamforming allows much denser deployments compared to single antenna systems. The possibility of operating high-order modulations (16QAM, 64QAM ) greatly improves the overall capacity. Copyright © 2018 Zyxel Communications Corp. All Rights Reserved.